Here's another recipe from my mother. She just told me the recipe, and the reminiscences, verbally, (she says the recipe is too simple to write down! ); I've written it down in the first person, from her point of view. When I was young and Makiko and her sister were small, Makiko's father was sent to England by his company. After brief stays in London and Kent, we settled in Wokingham, a small town in Berkshire. (Nowadays I have heard it's grown a lot bigger.) This was in the 1970s, when we had to go all the way to London to buy basic ingredients for Japanese cooking, like soy sauce. Making any kind of Japanese food was a struggle. I grew some Japanese vegetables that I really missed, but had no chance of buying even in London at the time, in the garden of our rented house - things like shiso, mitsuba, shungiku, komatsuna, daikon and gobo (burdock). [See a dozen Japanese herbs and vegetables to grow - maki] I didn't know anything about gardening, so when my gobo and daikon weren't nice and straight, but were stubby ugly things with multiple roots, I wrote to my mother (international phone calls were so expensive then) in tears, asking her what to do. She wrote back so many times with detailed instructions - she was an avid gardener with a real green thumb. I still have those letters. As I gradually adjusted to life away from Japan and my family, I became better at using local ingredients and adapting them to Japanese methods. This very simple summer braised vegetable dish is one recipe that I came up with during those years, that I still make every summer. It doesn't even use dashi, which is standard in so many Japanese recipes. 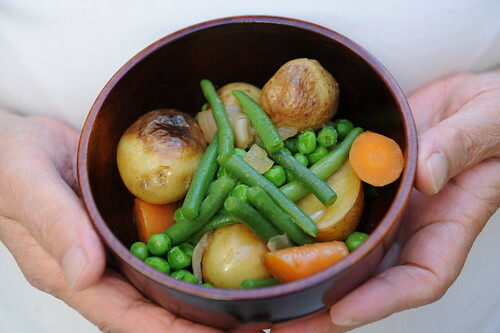 It uses vegetables that are available in Europe in early summer - new potatoes, green beans, peas, and carrots. The umami comes from the fresh young vegetables. Japanese cuisine is first and foremost about using seasonal ingredients, so to my mind, this is a very Japanese way of cooking. This makes about 4 servings as part of a Japanese meal, to accompany rice, miso soup and one or two other dishes. You can also serve it alone or as a side dish to meat or fish. To get the best flavor, it's very important to use the freshest, preferably organic, vegetables you can find. Wash the new potatoes, and cut in half if they are big. Scrub and cut up the carrots into chunks. (Don't peel the carrots - there's a lot of flavor in the skin!) Dry both well in a kitchen towel. Cut the onion in half, then slice against the grain (parallel to the root - as you would if you are cutting onion rings). Cutting against the grain ensures that the onions will cook faster. Heat up some oil in the bottom of the pan over medium-low heat. Put in the potatoes, and sauté while shaking occasionally until they are turning brown. Add the carrots about halfway through, and continue sautéing. This requires some patience, since it takes about 20 minutes or more. Drain away any excess oil at this point. Add the sliced onions to the pan, and sauté some more until the onions are transparent and limp. Add a small amount of water, just to about halfway up the potatoes. Add a tiny pinch of salt. Make an otoshibuta (drop lid) with a piece of aluminum foil, by crinkling it up so it fits on top of the vegetables in the pan, then poking a couple of holes in it with a chopstick. This otoshibuta ensures that the vegetables will cook evenly. In the meantime, cook the green beans and peas in boiling salted water until crisp-tender. (Put the green beans in first, then add the peas for a couple of minutes.) Drain and set aside. When the potatoes are tender (test by poking with a chopstick or fork) add the soy sauce, green beans and peas. Simmer for a few minutes longer while shaking the pan so that the flavors are evenly distributed. The water should be almost completely gone. This is best served warm, but is also good at room temperature. Optional: Add a little bit of sake or mirin near the end of the cooking process. This gives the vegetables a little added flavor and shine. You will notice that this recipe calls for sautéeing the potatoes and onions in oil before braising. While most people know about sautéing onions and garlic to bring out the flavor, not many do this to other vegetables. Sautéing vegetables before cooking further brings out the flavor and sweetness in them. To prevent the final dish from becoming too oily, I always drain off any excess oil before proceeding further, as I did here. Submitted by maki on 2009-06-26 14:52. This is great! I live in Ireland so these vegetables are very readily available - we always have peas and carrots in the fridge! Maki, I'm having fun seeing the recipes from your mom. Thanks Kalyn! :) I'm having so much fun posting them! Can I simply add renkon to this recipe to make braised renkon? Do we need to saute the renkon too? Renkon needs a bit of special treatment to prevent it from going rather brown and bad-tempered looking - see how to cook renkon. i made this yesterday with fresh vegetables from the farmer's market. it was delicious, thanks! I totally agree. I believe that Japanese cookery is, like you say, deeply rooted in seasonality and expressing the fresh, natural flavours of vegetables through sympathetic cooking and seasoning. I envy you for having lived in Kent; a lot is said about how it is the 'garden of England' and the South in general is so rich in fresh produce. It's harder now I'm living in the North, but there are still good local products to enjoy, if you take the time to look. I will definitely be trying this dish at the weekend. I've made this twice now, and it is fabulous. I'm enjoying making the most of the new potatoes while in season. I can't believe how good the veggies taste just for sauteeing them at the beginning. Brilliant! I just cooked these to go along with stuffed chicken breasts, and my boyfriend pronounced it the best dinner I've ever made. I concur that this is a dish that's sooo much more than the sum of its parts. Thank you, thank you for posting it, and thank your mum for taking pity on those of us without her background and kitchen smarts. Tonight I made this yet again, with the addition of yellow beets (added at the same time as the carrots), and it was a winner. Maki-san, you rock! I've been reading this site from the Justbento site... reading through recipes at the moment, I thought I'd comment on this one as I live in Wokingham! It's still rather rubbish, but the main supermarkets at least do sushi ingredients now, and quite a bit of things. Thank you so much for your wonderful sites!! 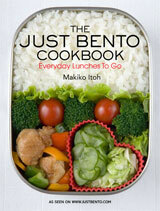 I love Just Bento and Just Hungry. I made this tonight for dinner and everyone like it! It was absolutely delicious. The only problem was that I couldn't get the vegetables to cook evenly. Some potatoes and carrots were soft, and some were hard. One potato half was inedibly hard. x[ But it's okay, the rest was yummmy. :] I've made other recipes from your sites too, like the tuna tofu miso mini burgers, the root vegetable nimono with miso, and the tuna soboro, and I look forward to making many more! :D Next for me is shrimp tofu mini burgers!